To view the Conferences Photo Gallery, click here. To view the Events Photo Gallery, click here. Note: click on a thumbnail to view the full-sized image. 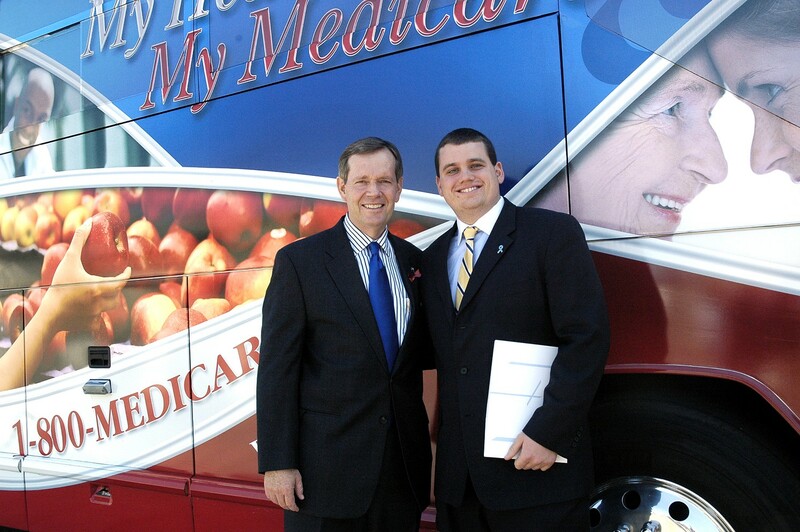 Scott Williams pictured here with Secretary Michael Leavitt of the Department of Health and Human Services at the kick-off of the "A Healthier US Starts Here!" CMS Prevention and Wellness Initiative. 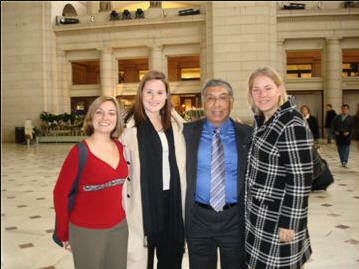 Alexi Thomas, Elizabeth Suman, Megan Meehan and Dr. Himansu Basu the International Chairman of the International Fellowship of Rotarians in Medicine/Health. Joseph Arite and Scott Williams are shown with proclamations from Governors naming Men's Health Week in their states. Sponsors of the Congressional Men's Health Screening. Scott Williams, Alexi Thomas, Congressman Virgil Goode (VA), and Joseph Arite. Governor Dave Heineman of Nebraska presents a copy of his 2005 proclamation declaring Men's Health Week in Nebraska. Congressman Joe Baca (D-CA) and Dr. David Gremillion (MHN Board of Directors) at the 6th Annual Congressional Men's Health Screenings. Congressman Charlie Stenholm (R-TX) attends a MHN-sponsored men's health screening in June of 2000. Congressman Dana Rohrabacher (R-CA) gives men's health the "thumbs up" at a year 2000 men's health event sponsored by MHN. Russell Williamson (Pfizer Inc) presents Congressman Rodney Frelinghuysen (R-NJ) with a proclamation declaring Men's Health Week in New Jersey at a June 2000 men's health event sponsored by MHN. Senator Richard Shelby (R-AL) and Senator Bill Frist (R-TN) attend a 1999 MHN-sponsored men's health event. Congressman Frelinghuysen (R-NJ) accepts a proclamation proclaiming Men's Health Week in New Jersey from Betty Gallo (Dean & Betty Gallo Cancer Center) at a 1999 MHN-sponsored health event. Former Senator Bob Dole (R-KS) with Ronald K. Henry (Co-founder, MHN). Hamilton Jordan (White House Chief of Staff, Carter Administration) and Ronald Henry, Esq. (Co-founder, MHN) participate in a panel discussion on men's health at a health fair in Philadelphia, 1999. Robert S. DiPaola, MD, Executive Director, The Dean and Betty Gallo Prostate Cancer Center (New Jersey), discusses treatment options with a patient. Megan Smith (MHN) revs it up at a NASCAR men's health event, September 2000. Megan Smith, Senator Richard Lugar, Indiana and Betty Gallo at the Senate Health Fair on September 28, 2000.